This article is one in a series outlining the nine research projects which are currently being undertaken, funded by CONNECTED in the first phase of pump-prime funding. To read all the available articles use this link. 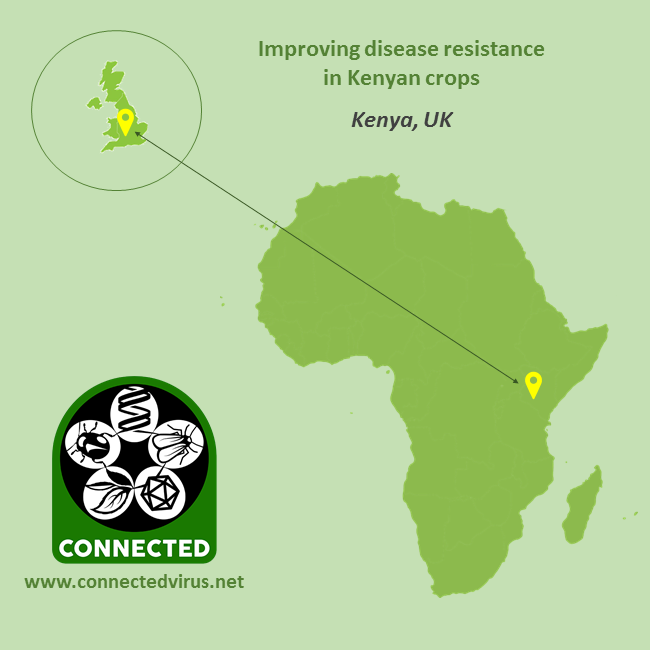 Cabbage is the third most important and commonly consumed crop in Kenya, yet Turnip mosaic virus (TuMV) is known to limit its cultivation. It can reduce weight yields of cabbage (Brassica oleracea) by up to 50% and result in 25% of plants not being marketable. TuMV also commonly affects the production of kale. A potentially durable disease resistance trait has been identified in the distantly related Chinese cabbage (Brassica rapa). This project explores the movement of this trait from Chinese cabbage to Kenyan cabbage and kale varieties, using conventional plant breeding methods, seeking to provide durable disease resistance. Lowering the cost of cabbage and kale production, by reducing yield losses, will result in cheaper retail prices, helping to fight malnutrition.